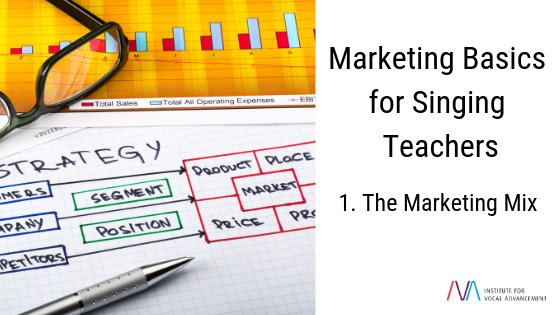 Over the next couple of months, we are going to take you step-by-step through the basic elements of a marketing strategy. We will cover the marketing mix, competitor analysis, customer segmentation, branding fundamentals, and promotional tactics to help you focus your marketing and build awareness of your voice studio. Let’s begin! The marketing mix represents the core building blocks of your business: the who, what, when, where, and how of your voice studio. Marketers use a simple “7Ps framework” to think through and record these important basics. Below we explain each “P” so that you can develop and document your own. For singing teachers, the product is most likely a service (e.g., singing lessons). However, some of you may choose to split this into different categories if you consider them quite separate (e.g., children’s lessons vs. adult lessons), or some of you may have additional offerings under the same business name (e.g., song-writing, performing, leading a choir, publishing resources). For each product, you will need to set a sensible price that is appropriate for your target customers, your level of skill and experience, and your local market. IVA Master Teacher Stephanie Borm-Krueger has already written some great guidance to help you with this aspect. Place relates to the physical location of your voice studio. Under this subheading, you should describe what kind of area this is (e.g., business, residential), what kind of building it is (e.g., community, commercial, private home), how easy it is to access (e.g., on foot, public transport links, parking), how easy it is to find, and what kind of tone is set through the location of your studio. Place can also encompass digital spaces. If you have a website, this acts as a kind of shop window for your studio, and you may also enroll people, book sessions, or take payment online. When considering the digital Place, describe whether the systems are reliable, convenient, and easy to use. This P is about all the people who contribute to your business, whether they’re the founder, the cleaner, or the contractor. It is important for everyone that represents your voice studio to “sing from the same hymn sheet” (pardon the pun) and genuinely demonstrate your brand values (more on that in a later post). It might be just you running the show, and that’s fine, but you may also have a business partner, or perhaps you share a receptionist with other businesses in the building, or sometimes your husband/wife/partner/child may answer the phone when a customer calls. Knowing who plays what role in your business will help you train and inform them appropriately to manage the “customer journey” (see Process) effectively. The Process, or customer journey, is how a student experiences your brand, from becoming aware of it, to considering it as an option, to enrolling, to staying with you, and finally to recommending it to others. How do singing students hear about your voice studio? How do they make the first contact? What information do you provide at which point and in what format? Do they have to fill out any forms? Do you offer a trial or initial meeting? Do parents sit in class with their children? How do you greet each student? What is the structure of each lesson? How do students know what to expect? What elements of choice do you give students? How do you end a lesson? What happens if a student is early, late, or fails to show up? How do you communicate important information to students? While Place describes the location, Physical Evidence in a voice studio context refers to the environment you create through interior design and equipment. For instance, is your studio stylish and high-tech, or comforting and homely? What tone do you set with your furnishings, wall decorations, colors, and room layout? If you have a waiting area, what is that like? Where does branding appear in a physical format at your studio? For advice on equipment, see our previous blogs, part 1 and part 2. To most people, Promotion is what they think Marketing is. However, as you’ve just read, a lot more needs to be considered and confirmed before the seventh P is even put into action. By using the 7P marketing mix framework, you will be able to explore, identify, and articulate the fundamental building blocks of your business. Doing this exercise will help you see gaps and opportunities, unleash some creative ideas, and understand how customers currently experience your brand. From this firm foundation, you can start to build on your strengths and address your weaknesses, to develop your brand, improve the customer journey, and attract new students.